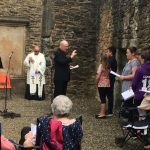 The annual ecumenical service for Maybole community with the blessing of the town’s Gala King and Queen took place on Sunday 3rd June at the Collegiate Church (the Auld College Church) on Abbot Street. 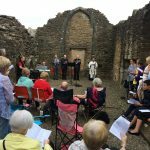 This was a change of venue, with the service usually taking place at Crossraguel Abbey, but feedback was positive with many locals reporting never having been into the grounds of the old church in the heart of the town! The Collegiate Church is the oldest place of worship in the town, dating back to 1371. 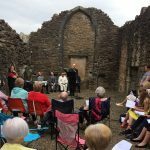 About 50 attended the service in the open air among the ruin of the old church where prayers were said and hymns were sung. The sun even shone, in a welcome change from last year! This year’s Maybole Gala King & Queen were blessed by Canon McGee. They are Alexander Brown and Anna Cochrane from St Cuthbert’s Primary School. 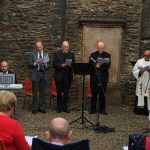 The service was organised by Maybole Council of Churches representing the town’s four churches with priests and ministers attending from all: The Rev Jim Geen (St Oswald’s); The Rev Stephen McGarva (Maybole Baptist Church); Mr Glenn Ronald (Maybole Parish Church); The Very Rev Canon John McGee (Our Lady & St Cuthbert’s Church). The Rev Jim Geen led the service with the other ministers played an active part in leading prayers. 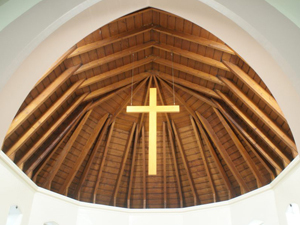 The sermon was given by The Rev Jim Guthrie, the former Locum Minister of the Parish Church. 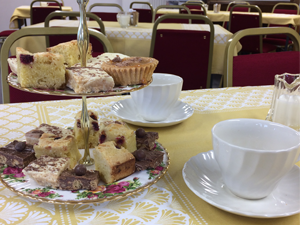 Thanks to Maybole Community Association and Historic Environment Scotland for their support in organising this service.